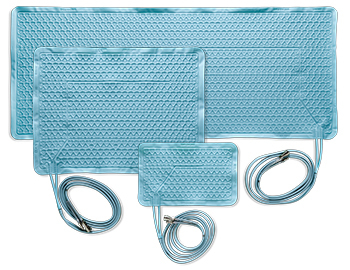 The PlastiPad is a re-usable water blanket that is used for heating or cooling of the patient. It may resist punctures and has a seam strength that helps prolong the life of the blankets. The PlastiPad blanket utilizes a random flow pattern for uniform distribution of water, yielding fast and efficient circulation throughout the entire blanket to provide effective patient therapy.